The Epox 4BEAV we tested appeared to be an engineering sample, and there were still a few quirks in it. 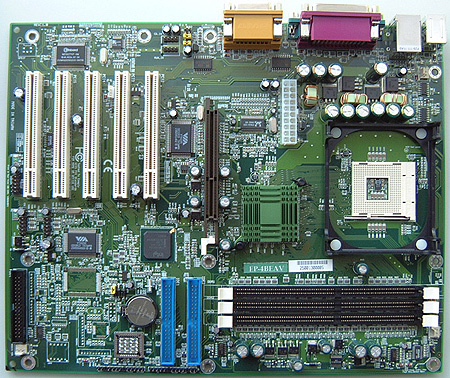 One of the first things we noticed about the motherboard was that it used the older ICH2 southbridge, rather then the newer, USB 2.0 compatible ICH4. To make up for the USB 2.0 deficiency, Epox equips the 4BEAV with the VIA VT602 USB 2.0 chipset. 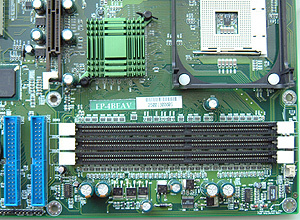 Another thing that bothered us was the very close proximity of the IDE ports to the AGP slot. We had to wrap the IDE cables around the Albatron GeForce4 Ti4600 test card. Needless to say it was a little too close for comfort when you're dealing such an expensive videocard! 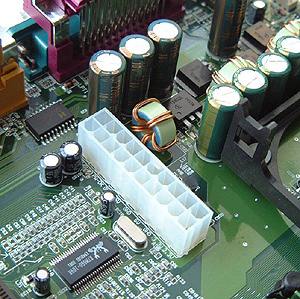 Performance wise, the motherboard was "middle of the pack" and performed as expected during testing. It is loaded with a ton of overclocking features in the BIOS, but seemed still to be quite "beta" as it wasn't very good at overclocking. Overall the Epox 4BEAV is a good board, but given the choice between it and the other Epox motherboard in the round up I'd have to side with the latter.